Dana White put a long debated argument to sleep after Georges St-Pierre’s seventh consecutive Octagon victory at UFC 111 on Saturday night. 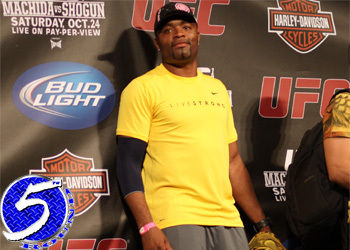 Although GSP is great, Anderson Silva is the best fighter in the world according to the UFC president. Many others have Fedor Emelianenko in the mix as well, but we all know that White would never give Fedor that much credit, at least until he’s in the UFC of course. Responding to the negative criticism that St-Pierre received from fans through Twitter and inside the Prudential Center, White stood up for his welterweight champion, who has now won by unanimous decision in three of his last four bouts. “Georges St-Pierre is one of the best in the world. People are putting him in contention for pound-for-pound best in the world with Anderson Silva,” White told reporters. It would be hard to argue that St-Pierre wouldn’t at least be in the conversation with Silva, but that’s as far as it should go according to the brash president. “I personally [think] it’s 100 percent fact that Anderson Silva is pound-for-pound the best fighter in the world … period,” White continued. After the UFC 111 post-fight presser, the odds of GSP actually moving up in weight to face Silva seem less than likely.